This Italianate house is a mirror image of 1413 Fernwood Rd and has been fully restored. See 1413 for a description. For decades many elements were missing, but from 1992-2010 owners Terrance Merx and Clara Toledo gradually returned all the exterior decoration. This included cresting, finials and widow’s walk on the roof, balustrades over the little balconies on front and left side, and the details on the window casings and bays. In the process, they reconstructed the back verandah and added a second floor above it. The front porch, which needed extensive repairs, has two square posts and two pilasters, square balusters and sawn brackets. The square brick chimney adjacent to the widow’s walk has four flues and is corbelled and panelled. As at 1413, the pent roofs are shingled and the house is clad in drop siding. The house was duplexed in 1951. Behind the house is an original carriage house, which Terry and Clara also restored. It was the first carriage house to be designated heritage by the City. In 2011 they won a Hallmark Award for their sterling efforts. 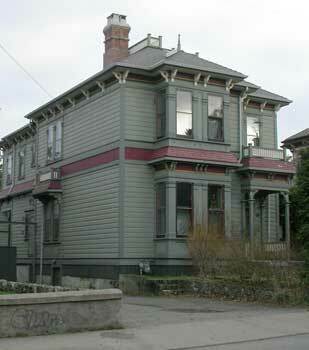 1890-1927: The Marshalls built this house a year after 1413 Fernwood, for just $3,000. Charles built it for his daughter Sarah Elizabeth Marshall (b. Pennsylvania 1866-1940) by his previous wife, Mary Boyd from Ireland. In 1888 Sarah married Joseph Henry Baker (b. Chesley, ON, 1860-1940), who came to Victoria prior to 1881. For many years, Joseph ran a boot and shoe shop at 59 Government St, but had retired by 1912 when he served as city alderman. In 1926-27 they moved to Oak Bay to be near their daughter Maude Gunson, who in 1913 had married Carron Brown Jameson of the W.A. Jameson Coffee Co.
1927-31: Grand Spot News Stand and book store proprietor Albert Edward “Bert” Coles (1871-1955) and Edith Emma (née Baker, 1873-1954), and their offspring: Albert Edward Coles, Jr, an engineer for the Gordon Building; Edith Florence Coles, saleswoman at Liberty Chocolate Shop; Eva Lillian Coles, a waitress at the Dominion Hotel; and Walter Richard Coles, a chauffeur and driver with Vancouver Island Rapid Transit. Edith and Bert were born in London, England, and came to Canada in 1905, then to Victoria c.1920. 1936: Master mariner Berton Miller Balcom and his wife Daisy. 1938-92: Carpenter and builder Frederick William Marsland (b. Ontario, 1879-1974) and his wife Fanny Jeanette/Janet (née Wilson, b. Ontario, 1885-1972). Their son Corp Kenneth Robert Marsland (b. Saskatchewan, 1920-1944) served during WWII with the Royal Winnipeg Rifles, and died aged 23 in France two months after D-Day. He had been a carpenter’s apprentice when he joined up. The Marslands duplexed the house in 1951, and owned it until their deaths. Their son Douglas then rented it out.